Bobby complains, "Doc, I'm having trouble getting it up, it insist looking at my shoes." 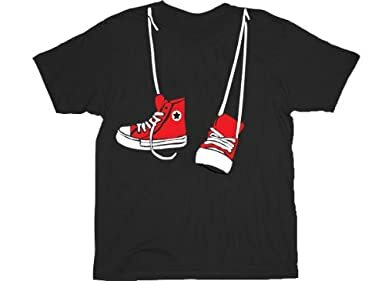 The doctor examines him and says, "You'll need to tie your shoes and hang them around your neck, this might solve your problem". An elderly couple, Margaret and Bert, moved to Texas . Bert always wanted a pair of authentic cowboy boots, so, seeing some on sale, he bought them and wore them home. Margaret looked up and said in her best deadpan, "Bert, what's different? your Schwanz is hanging down today, it was hanging down yesterday, it'll be hanging down again tomorrow." Furious, Bert yelled, "and do you know why it's hanging down?" "it's hanging down cause it's looking at my new boots"
p.s cause I couldn't find a man with his shoes around his neck here is the best picture to describe my great idea, hope you got it eh? now you do not need any pills to give your crane a nice lift.